From The Desk of Scott Martin, Direct Response Copywriter … Aspen, Colorado. If you’re super-serious about becoming a super-successful direct response copywriter, then pay close attention. I’m going to reveal how you can reach your goals … based on my experience. You’ve heard a lot about this subject. I get that. But you’re going to discover the truth about what it really takes. No fluffy stuff … and no crazy promises. Just the raw truth from a practicing direct response copywriter. I’m Scott Martin and I’ve been writing copy for 28 years. In the last four years, my copy has generated over $400 million in sales for my clients. One of my clients has gone from 2 employees to 56 and is a dominant force in their niche. NBC just bought the company. A VSL I wrote for a $19 information product was generating $1.5 million in sales a month and the client is a small company. There have been some failures, for sure … but I’m a successful direct response copywriter. I live exactly where I want to live. I have time for friends, family, and my favorite activities … plus I earn a more than adequate income. And one more thing … my website usually ranks #1 or above the fold for numerous search terms like “direct response copywriter” and, as a result, my website has generated over 700 leads in 4 years. Famous copywriter Bob Bly says he doesn’t like it when copywriters and Internet marketers boast in their copy. I get that. But if you’re a copywriter and you want to succeed, who are you going to listen to? A copywriter who is helping a client sell over 64,000 ebooks a month … or someone who claims to know what they’re doing? So I included the copy above to back up my claim that I’m a successful copywriter. There are hundreds of people who teach copywriting who have never really sold a thing. They have not spent time in the direct response battlefield, getting the snot beaten out of them … or actually writing copy that motivates tens of thousands of readers to pull a credit card out of their wallet or call a toll-free number for more information. On this web page, I’m going to help you out by revealing the REAL keys to success. You might have read some of these in books or other websites. But many of these keys will be new and surprising. I’m not the only successful direct response copywriter on the planet. I know some copywriters who are significantly more successful and approaching “two comma” territory. I know others who don’t earn as much, but they still make a decent living. My point … it can happen for you … it WILL happen for you if you take the correct steps … the steps you’ll discover below. I wish someone had shared these with me when I was just beginning my journey as a direct response copywriter. As one famous copywriter once said to a group of copywriters … THERE’S AN OCEAN OF WORK OUT THERE … AND YOU’RE A THIMBLE. Companies of all sizes are selling direct to consumer, bypassing traditional retailers. This means more work for direct response copywriters. Companies of all sizes measure their results and discover what hard-core direct marketers have always known … that the greatest ROI comes from the work of a direct response copywriter … and it’s all measurable. This means more work for direct response copywriters. So think about all the benefits you can gain when you “make it” as a copywriter … a solid income … you work for yourself … you live where you want … you can organize your schedule around your family and other activities … you can pick and choose your clients (I’ll show you how in a minute) … you don’t have to battle the daily commute. And so on … use your imagination and look at the top copywriters and where they live … and how they live. There’s a ton of terrible advice out there when it comes to becoming a copywriter. You can be successful … but it’s not easy … especially if you take the wrong advice. 98% of the advice comes from people who have never been successful … or copywriters who never really liked writing copy and have ‘retired’ to provide advice … often for $500 an hour ... or more. These copywriters will methodically berate you and beat you up as part of trying to help you. Been there, done that. And never again. First … get an entry-level position with an advertising agency or a direct response company. Many companies offer these positions, including some of the big players like Agora. Two … Build your own portfolio around “simple” copy like emails, PPC ads, and display ads. Tens of thousands of companies are DESPERATE for someone to write this “simple” copy and they will often give a freshly-minted copywriter an opportunity … even without experience. You can also ask to write copy for free for friends to build your initial portfolio. Note that I DID NOT recommend looking at classifieds, going to the “lowest bidder” sites like Upwork, joining Facebook groups, or going to live events. There’s a much better way to find clients and I’ll reveal how you can get that in a minute. KEY #1. Learn your trade. You MUST fully understand the time-tested fundamentals of direct response copywriting. You don’t have to be epically fantastic at first … that will come. KEY #2. Learn how to sell. Copywriting is sales. Get a part-time job actually selling products and services. Or read every book you can about sales … written by people who have actually sold stuff. KEY #3. WRITE and write some more. Create your own products or simply make some up. Before long, you will have a portfolio. KEY #4. Create an awesome website. Need inspiration? Spend a lot of time looking at this one. Surf around looking for copywriter websites. KEY #5. Build a database of ideal clients, then contact them frequently. I have a database of more than 2,000 potential clients who are looking for copywriters. I will NEVER worry about finding clients. KEY #6. Understand testing. You don’t have to be a mathematician but you have to understand the fundamentals of testing if you’re a direct response copywriter. KEY #7. Set goals and gain a sense of direction. Make the goals lofty … and based on your lifelong financial goals. Choose a direction based on your interests. KEY #8. Don’t get lonely. Being a direct response copywriter can seem a little lonely. Spend time with other creative types in person … or online. I have four copywriters who are competitors … but friends. KEY #9. Read and learn … constantly. I’m always reading books about direct marketing and direct response copywriting. KEY #10. Be professional. Hit your deadlines. Be pleasant. Return phone calls and emails. Believe it or not, some copywriters think it’s acceptable to act like a total jerk. KEY #11. Be global. Many freshly-minted copywriters make the mistake of trying to find their first clients locally. I have clients around the planet. KEY #12. Remember that YOU’RE the boss. YOU choose your clients and NOT the other way around. KEY #13. Be careful picking your clients. Before you take on clients, define what you want from them. KEY #14. Go to conferences and meetings. But do this to learn and get better at your work. They are not typically the best places to find clients. KEY #15. Avoid advice from “gurus” who have never actually written high-performing copy … or don’t write copy anymore but think that every other copywriter is useless. KEY #16. Understand that it’s a blood sport. Everyone is accountable in their own way but direct response copywriters are especially exposed. That’s where a client who tests is especially important. KEY #17. Find clients who have traffic. Either they have a great in-house list … or they know how to buy traffic. The copy can be great … but it’s useless if the wrong people are seeing it. KEY #18. Don’t take on marketing challenges. There are plenty of companies who have really great products and services … with tens of thousands of people who want those products and services. KEY #19. Only work with clients who really understand marketing. Don’t work with amateurs. KEY #20. Don’t ignore the agency markets. Advertising agencies and digital marketing agencies can be great places to get started. And they increasingly need direct response copywriters. KEY #21. Patience. As Jerry Garcia once sang, “keep your day job till the night job pays.” You can be up and running quickly but building a long-term business takes time, energy, and patience. KEY #22. Understand compensation and track your hours. I charge by the project but I track my hours. I’m getting more aggressive about fees because there’s a lot more demand than supply. KEY #23. Don’t get into direct response if it’s not for you. There are other avenues for copywriters. KEY #24. Be aggressive. Sit back and hope that work and success comes your way and guess what? It won’t. Go get your success. I have read well over 100 books about marketing, copywriting, and copywriters … something important I discovered … they have these traits in common. They work hard to be better copywriters. They have studied all the greats … the copywriters who really produced big-time results. They have the top clients. They don’t put up with bad clients. They research like crazy in order to know the product and the market intimately. They love to test and test like crazy. They enjoy writing copy and like to be around direct marketers. Almost all of them have really superb websites. They learned from at least one great copywriter … as a copy cub or through information products created by top copywriters. They’re careful but aggressive about compensation. When they get beaten up … copy doesn’t convert … they pick themselves up off the floor … and make it work. They always want to get better … and dramatically improve their results. They have clients with big lists and epic traffic. They know how to write FAST … so they maximize their hourly rate. Most have a sense of who they want to work with … and often have a great database of others they want to work with. But remember … there are many ways to reach your goals as a copywriter. Ultimately, you must have the traits above. You’re here because you want to be a successful copywriter. I can help but YOU have to take the next step. There are three ways I can help. OPTION 1. Sign up for my free bi-monthly email … THE PROSPEROUS COPYWRITER. At least twice a month, you’ll receive tips, ideas, and recommendations about how to reach your copywriting goals … based on what’s working for me … and what’s not. As a special bonus, you’ll receive a FREE special report … “Desperately Seeking Clients … THE GOOD, THE BAD, AND THE UGLY.” My thoughts about 18 ways to find clients … based on 28 years of experience. Hint … I only really like 3 of the 18 ways! PRIVACY. I won’t share your information with other people and you can opt out at any time. OPTION 2. Gain access to my private database of more than 2,000 potential clients who are desperately seeking copywriters. I'm not currently offering this database but I might in the future. Contact me here to get on the waiting list. OPTION 3. Accelerate your progress on the road to becoming a stonger copywriter by gaining access to more than 150 "look over my shoulder" copywriting videos. You can gain this access through THE ASPEN SCHOOL OF COPYWRITING ... it's a password-protected website I created to help copywriters learn how to write powerful direct response copy. Over 150 “look over my shoulder” training videos to help you become a stronger copywriter. 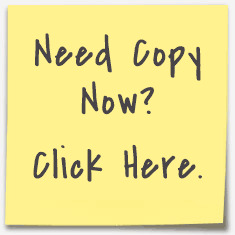 Copy templates you can use to help you write powerful copy 5 times faster. Videos, podcasts, and documents covering every aspect of finding clients, keeping clients, and overcoming typical copywriting challenges. There's the option of a one hour consultation with me so you can ask any questions you have about the copywriting journey. To discover more about THE ASPEN SCHOOL OF COPYWRITING, click here now. For a limited time, there’s a special low introductory price for lifetime access to The Aspen School of Copywriting with options starting at just $69 a month. Click here for special information and the low price. In the options above, I want you to understand you’re getting extremely valuable information from me … a copywriter with 28 years of experience. You’ll discover what works … and what doesn’t. I’ve written over 1.5 billion words. My copy has sold over $250 million of products and services in the last 5 years. The copy on my site has generated over 1,000 leads in 4 years. My clients keep hiring me … proof the copy converts and I take care of my clients. I live exactly where I want … and work when I want. I work hard but I have time for friends, family, and my favorite activities. My copy has successfully sold my products, including a regional magazine I grew from zero revenue to over $500,000 a year in just 24 months. Clients include many of the world’s top direct marketers. So you’re getting information from a copywriter who is actively working and succeeding. Good question … especially as I’m a busy and successful direct response copywriter. So let me give you some reasons. Many copywriters like to provide resources so they partially can be their own client. I’m one of those copywriters. I genuinely enjoy helping my fellow copywriters. We’re all in this together. I enjoy creating the content and I’m happy to share it with other copywriters. So … whichever option you choose from above, you’re getting information that can help you thrive as a copywriter. I can tell you’re serious about being a successful copywriter. And you’re ambitious. You’re part of the 20% of copywriters who want to make it. You can take advantage of the information I’m providing and move your career forward FAST. For the FREE newsletter and PDF, enter your information above. For information about THE ASPEN SCHOOL OF COPYWRITING,click here now. If you’d like more information about the options, contact me personally. P.S. I love meeting and speaking with my fellow copywriters. So feel free to contact me at any time. Just click here.